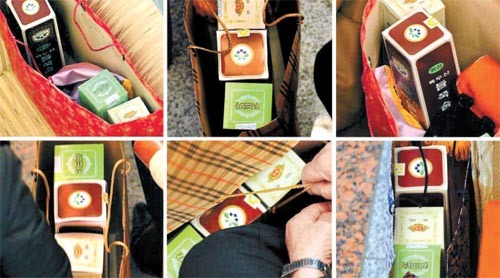 UPDATE 9 (11/5/2010): The Joong-Ang Ilbo posts images of the gift bags given by North Koreans to their Southern relatives. After being reunited in North Korea for three days, 97 families separated by the Korean War bid one another farewell again on Monday, weeping over a reality forced upon them by six decades of conflict between their countries. Touching the palms of their wrinkled hands to family members’ on the other side of closed bus windows, the South and North Koreans said their last words of blessing to each other on the final day of their reunions at this mountain resort in the communist state. “I love you. I love you,” one South Korean woman shouted to her North Korean family member aboard a bus as it prepared to depart from the reunion center. Many North Koreans stood up inside the bus for a better view of their South Korean family members waving at them. One of the three buses carrying North Koreans had its windows completely closed, muffling the words of its sobbing passengers. As the white buses started to leave the center, the cries grew louder among the hundreds of South Korean family members sending them off. Many watched helplessly, long after the buses had disappeared. Some sat on the ground and broke down in yet more tears. One family member swore at the utter sadness of the scene, deploring the fact that none of the Koreans here could guarantee another meeting even though they lived only several hours’ drive from each other. Millions of Koreans were separated during the 1950-53 Korean War that ended in a truce. Many of them have died over the years, and there are now 80,000 South Koreans on an official waiting list for reunions. The figure does not take into account the more than 40,000 applicants who have died or given up on the search. Since 2000, when the Koreas held their first summit, they have briefly reunited over 17,000 people face-to-face and an estimated 3,700 via video. The latest reunions came as tension remained at the highest point in years after the sinking of a South Korean warship in March. The South blames the North, but Pyongyang denies any involvement. The reunions, organized through the Red Cross channel, also came as the North tied additional future meetings to massive “humanitarian” assistance. In their Red Cross talks last week, the North demanded 500,000 tons of rice and 300,000 tons of fertilizer from the South. Yoo Chong-ha, the head of Seoul’s Red Cross, said he proposed holding the next round of reunions in March and to use the time until then to verify the whereabouts of family members being sought by the other side. During their “farewell session” on Monday morning, the families sang traditional folk songs like “Arirang” together and made sure that their children could recognize each other through photos if and when the Koreas reunify. Unable to stand up after a deep bow to his father, 62-year-old Ko Pae-il sobbed with his head down, grabbing the hands of the man from whom he was separated at the age of three. Wearing a coat given to him by his family members from the South, Park Byong-jin, a 80-year-old North Korean, embraced his South Korean relatives in tears, promising to meet them again. The governments of the two Koreas prohibit civilian contact without prior authorization. Promises of reunions rarely materialize, swayed heavily by the state of cross-border relations. The North Koreans were generally restrained in their expressions and action, some freezing in front of journalists and cameras. “Give me something I can remember you by,” Kim Kyeong-oh, a South Korean, said as he pleaded with his older brother, who was wearing a coat Kim had brought for him. Many family members embraced, cheek to cheek. One South Korean woman moaned, muffling herself with a scarf, saying, “I won’t cry. So you shouldn’t cry, either, sister.” Another family toasted with soda as they wished for another chance to be reunited. Parent-child reunions were rare in this week’s event, underscoring the growing number of people who die while waiting for their chance to reunite. On Wednesday, another reunion event will take place at Mount Kumgang, bringing about 100 other South Koreans here. Those reunions will last until Friday. Swallowing the sorrow of having to part again in less than a day, Korean families reunited after 60 years of separation sang together, posed for photos and eventually broke down in tears on Sunday as they promised to meet again. Exchanging the addresses of their homes on either side of the heavily armed border, some families prayed for a chance to be reunited again while others plunged into doldrums over fears that the two Koreas may never be one again. “Their stress will peak tomorrow when they have to say goodbye to each other,” said Lee Jae-pil, a medical doctor assigned to the reunions of 100 families from both Koreas from Saturday to Monday. The reunions brought about 430 South Koreans and 110 North Koreans together at this famed mountain resort in North Korea where the bright colors of autumn leaves matched the excitement of families meeting again for the first time since the Korean War. The 1950-53 war ended in a truce rather than a peace treaty, leaving the two Koreas technically in a state of conflict to this day. No means of civilian contact is available between them, and over 80,000 South Koreans are on a waiting list for reunions with their loved ones in the North. The figure does not take into account the South Korean applicants who have died while waiting, numbering more than 40,000. Shim was one of many who sang — not out of pleasure but out of sorrow — here at this banquet hall, packed with people photographing each other for one last time and sharing snacks prepared by North Korean organizers. The conviviality during a luncheon earlier in the day had mostly faded as the families began to face the reality that they would part on the third day of reunions. “Ask your father everything you have ever wanted to know now, or you may regret it,” one family member told Ko Pae-il, a 62-year-old who was reunited with his 81-year-old father. Ko, a Korean-American from Alabama, had said earlier it was too “cruel” that he had to say goodbye to his father, from whom he was separated at the age of 3. “Father, father, be healthy, OK?” Ko said, racked with sobs. Such parent-child reunions were rare in this week’s event, underscoring the growing number of people who die while waiting for a chance to meet their loved ones again. Outbursts of tears grow fewer and fewer as the years go by, but the overwhelming sense of sorrow persists, South Korean Red Cross organizers say. “As we approach the time to say goodbye, things to say and things not to say are all racing out of our hearts,” Kim Gyoo-byeong, a South Korean reunited with his uncle, said. North Koreans typically refrained from giving truthful accounts of their lives in the impoverished North, instead praising the leadership of their leader Kim Jong-il and touting their socialist system. Earlier during the luncheon, a North Korean family member stood up and sang a hymn to the “Dear Leader,” freezing the atmosphere momentarily. Since 2000, when the Koreas held their first summit, they have briefly reunited more than 17,000 people face-to-face and an estimated 3,700 via video. The latest reunions come as tension remains at the highest point in years after the sinking of a South Korean warship in March. The South blames the North, but Pyongyang denies any involvement. These reunions, organized through the Red Cross channel, also come as the North ties such events in the future to massive “humanitarian” assistance. In their Red Cross talks last week, the North demanded 500,000 tons of rice and 300,000 tons of fertilizer from the South. Cheerfully thrusting rice cakes into each other’s mouths and taking Polaroid pictures together, South and North Koreans separated by the Korean War six decades ago dined together on Saturday, hours after the families were reunited at this eastern mountain resort in the North. The 97 families, including four parents who met with their children, set their hearts at ease as they shared warm food served at the family reunion center in Mount Kumgang just north of the heavily armed border between the Koreas. The more than 570 people, about one fifth of them North Koreans, dined on “galbi,” or a Korean beef rib dish, beef soups, the Korean alcoholic beverage soju, smoked salmon, rice cakes and a variety of fruits that included grapes, oranges and bananas. Many South Koreans improvised family photos by using Polaroid cameras, an invention that came in handy as the families had only three days to spend together. The first day of reunions took place en masse at a banquet hall. The second day allowed the families to spend time together separate from the group. South and North Korea, which respectively support capitalism and communism, remain technically at war after their 1950-53 conflict ended in a truce. The state of war has been the major blockade when families separated by the war sought to be reunited. Many family members have died after decades of longing. About 80,000 South Koreans are on an official waiting list for the reunions. The event, which runs from Saturday to next Friday, is the first of its kind in a year. Since 2000, when the Koreas held their first summit, they have briefly reunited over 17,000 people face-to-face and about 3,700 via video. The latest reunions come as tension remains at the highest point in years after the sinking of a South Korean warship in March. The South blames the North, but Pyongyang denies any involvement. The reunions, organized through the Red Cross channel, also come as the North ties additional ones to massive humanitarian assistance. In their Red Cross talks last week, the North demanded 500,000 tons of rice and 300,000 tons of fertilizer from the South. “From the viewpoint that we are one nation, we should help each other. If the South opens up to us, we have a lot more to offer,” a North Korean Red Cross official said on the sidelines of the reunions that he was helping to organize. Goh Bae-il, a 62-year-old man from South Korea, could not let go of the withered hands of his 81-year-old father from North Korea when they met for the first time in 60 years on Saturday in Red Cross-arranged reunions. The two were separated in 1950 when the three-year Korean War broke out. The junior Goh was barely three years old and has since grown up in South Korea and the United States. The senior, a frail man who would not say how he ended up in North Korea, labored to extend his arm to his son as a teardrop rolled into the deep wrinkle under his eye. The reunion, one of the 97 stories of separation and longing that unfolded at this scenic mountain resort in North Korea, underscored the pain and suffering that the six decades of national division has inflicted on Korean families. The war technically continues to this day as it ended in a truce, blocking the citizens of the two Koreas from meeting or contacting each other freely. The Gohs were one of only four cases on Saturday where a parent met his or her child. “This must be a dream,” Ji Ja-ok, 79, said as she met with her 75-year-old brother, Ji Pal-yong, who was forcefully inducted into in the North Korean army during the war. “We just assumed you were dead!” she said as she kept feeding her brother cookies and sweets that had been prepared on their table by the organizers of the reunion event. Since South and North Korea held their first summit in 2000, a total of 18 reunions have been organized for separated family members on both sides. including the one that began Saturday. Crying with her face buried in the laps of her 75-year-old brother, Kim Ok-ja recalled the years of longing and suffering their parents had to undergo before they passed away. “They lived in sadness for not being able to see you again, brother,” she said. Kim Hyong-gun, patting his younger sister’s shoulders, tried to console her, saying that at least they were now reunited. Kim Rye-jeong, 96, the oldest South Korean to travel to North Korea this week, was reunited with her 71-year-old daughter, and told her of the many nights she spent seeing the young image of her in her dreams. “Now you’re here, now you’re here,” the mother told the daughter as tears welled in their eyes. More than 80,000 South Koreans are waiting for a chance to be reunited with their family members left in the North. The official figure does not take into account those who may have given up on their search or the 40,000 applicants who have passed away. Many families here brought presents that included bananas, watches, U.S. dollar bills, medicine, vitamins and clothes that would keep their loved ones warm in the North. The families will part again on Monday after a series of reunion meetings. There is no hope that they will meet again anytime soon. The latest reunions came amid a new wave of tensions after border soldiers of the two countries exchanged fire a day earlier. No casualties were reported in the incident. In March, a South Korean warship sank after being attacked by a torpedo blamed on the North. Analysts say the North proposed the latest reunions in an apparent effort to ease tension and foster an atmosphere favorable for its hereditary power succession plan. The Korean War broke out when North Korean forces stormed into South Korea in June 1950 and advanced as far as to the perimeter of the southeastern port city of Busan. Upon intervention by U.S.-led U.N. forces, the North rolled back, forcing many South Koreans to join its retreating army. Hundreds of then-South Korean soldiers are believed to be still living in North Korea. South and North Korea on Wednesday failed to reach an agreement on holding regular reunions of families separated by the 1950-53 Korean War, officials said Wednesday. The two sides are to meet again on Nov. 25 at a yet-to-be-determined venue. Earlier Wednesday, North Korea demanded 500,000 tons of rice and 300,000 tons of fertilizer in humanitarian aid from South Korea in return for concessions on family reunions. Red Cross delegates from Seoul told their North Korean counterparts here that their organization had no power to approve such massive aid, a South Korean official involved in the talks told reporters. North Korea demanded 500,000 tons of rice and 300,000 tons of fertilizer in humanitarian aid from South Korea in return for concessions over reunions of families separated by the Korean War, officials said Wednesday. Red Cross delegates from Seoul told their North Korean counterparts here that their organization had no power to approve such massive aid, one South Korean official involved in the talks told reporters. The demand was made during the second day of the Koreas’ Red Cross talks. The North had asked on Tuesday that the sides increase “humanitarian cooperation projects” as a way to expand chances for families separated by the 1950-53 war to be reunited. The talks in the North Korean border town of Kaesong came ahead of the first family reunions in a year at the Mount Kumgang resort in eastern North Korea from Saturday to next Friday, a sign of easing tension on the peninsula. More than 80,000 South Koreans are waiting for a chance to be reunited with their loved ones left in the North after the 1950-53 war ended in a truce. About 20,800 Koreans have been reunited since 2000, when the countries’ governments held their first summit. Virtually no means of civilian contact are available between the two nations. “We may be able to discuss it in our next round of Red Cross talks,” one official said, adding the South proposed holding talks in late November in the South Korean border town of Munsan. At the start of the meeting Wednesday, Choe Song-ik, head of the North Korean delegation, pressed South Korea on the earlier demand for humanitarian projects. “There is a saying that one should not miss the right timing. Opportunities do not arise all the time, do they?” Choe said. Choe also noted that Yoo Chong-ha, head of the South Korean Red Cross, was nearing the end of his tenure and may need showpiece achievements contributing to a thaw in inter-Korean relations. Kim said his side had “carefully studied” the North’s proposals made a day earlier and called for a more conciliatory stance from his counterpart. South Korea stopped sending massive food aid to North Korea after President Lee Myung-bak took office in early 2008 with a pledge to link such assistance to progress in Pyongyang’s denuclearization efforts. The relations between the divided countries hit the lowest point in years when the South condemned the North in May for the sinking of one of its warships. Forty-six sailors died in the sinking that the North denies any role in. South Korea shipped 300,000-400,000 tons of rice to North Korea annually before Lee, a conservative, took over. The South this week is sending a shipment of 5,000 tons of rice to the North in flood aid through the Red Cross channel. The North Korean Red Cross is also demanding that the South resume its cross-border tours to Mount Kumgang, where a South Korean tourist was shot to death in 2008 after apparently wandering into a restricted zone. The tours immediately ground to a halt. North Korea says it has taken every measure to account for the shooting and guarantee safety, while the South calls for a renewed on-site probe and an array of tangible security measures. Earlier this year, North Korea froze and seized South Korean facilities at the resort, including a family reunion center, in anger over Seoul’s refusal to resume the tours. The prospect for reopening the Mount Kumgang tours worsened when South Korea condemned the North for the Cheonan sinking. The tours were long seen as a symbol of inter-Korean reconciliation and won Pyongyang millions of U.S. dollars every year until 2008. On Wednesday, the North renewed its demand that the two governments quickly hold dialogue on ways to revive the cross-border tourism project. North and South Korea on Tuesday exchanged lists of people who wish to attend reunions of families separated during the Korean War. Both countries’ Red Cross organizations shared the lists of 200 applicants for the upcoming family reunions. Seoul and Pyongyang will now search for and match up applicants’ family members and exchange the results on Oct. 18. The final lists will be announced and exchanged on Oct. 20 with only 100 applicants from each side to be permitted to attend the reunions at the end of the month. Seoul’s Red Cross narrowed down its list from an initial 500 after assessing factors such as health and willingness to make the trip. More than 80,000 Koreans in the South are waiting to see their family members in the North, but a Red Cross report shows about 260 of them die every month without being reunited. After three rounds of talks last month the two sides agreed to hold the reunions at North Korea’s Mt. Kumgang resort from Oct. 30 to Nov. 5. One hundred families from each side of the border will be allowed to meet their relatives from 30 October at a mountain resort in the North. Officials from the two sides also agreed to hold another round of talks later in October to discuss how to hold the reunions on a more regular basis, South Korea’s Unification Ministry spokeswoman Lee Jong-joo said. The agreement comes after military officials from the two sides failed to make any progress in their first meeting in two years. North and South Korea over the weekend took steps to hold another reunion of families separated by the 62-year division of the Korean peninsula, the first since last September and a sign that some relatively normal exchanges continue amid ongoing tensions between the two countries. As happened last year, North Korea proposed the reunion, issuing a statement Saturday in which it also pressed for more aid to cope with recent flooding. South Korean officials said they’ll announce a package of flood assistance, including rice and other goods, on Monday. South Korea said Sunday it viewed the reunion proposal positively and, as it did last year, suggested such events be scheduled regularly. North Korea has tended to use the reunions as a public-relations boost in recent years. This year’s reunion could take place as soon as this month, under the North’s proposal. Since they began in 2000, 17 in-person reunions and seven video-conference events have been held, allowing about 21,000 people from the two Koreas to meet. In South Korea, about 90,000 have applied to meet relatives in North Korea. No reunion occurred in 2008, when South Korea refused to participate after a South Korean tourist was shot and killed at a North Korean resort by a North Korean soldier. This entry was posted on Wednesday, October 27th, 2010 at 8:10 am and is filed under Civil society, South Korea. You can follow any responses to this entry through the RSS 2.0 feed. Both comments and pings are currently closed.